Considered by some to be Kong's best studio release, Push Comes to Shove is really the second of two outstanding Kong albums from their "peak" era. This one is not quite as straightforward as Phlegm, though it can hardly be thought of as a straightforward album as it is a genre breaker. The album goes more in depth into sound exploration and is somewhat less metallic than Phlegm, although their is still ample amounts of overdrive. More emphasis is put on atmosphere and finer qualities of the music than the actual notes themselves as on previous Kong releases. "New" is the best track here, being an epic-like piece that not only emphasizes their sound they had been building on but also gives us insight on the transition the band would make on the next record. Those looking for something similar to the Phlegm sound should try the opener Results, as it has a much rougher textured sound to it. 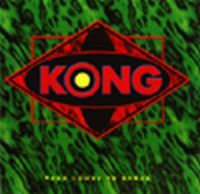 To those who have not seen my other reviews of Kong, it is recommended that you understand this band is one of the few that really sounds like nothing you've heard before, yet you will be familiar with it. An odd duplicity that the band is able to capture, making them one of the few bands on earth that is unlike anyone else, as overused as that phrase is. Also to note are the absence of vocals, yet the band is anything but a solo exercise for its musicians. You will find few solos across all of Kong's material. This album is probably the most difficult to approach for a new fan to Kong. Although, for fans of RIO/Zeuhl material this might actually be the best place to start. Not as complete as Phelgm, but the Boxset would capture almost all of Kong's best moments. Another remarkable contribution to the annals of music history that only a select few will be able to hear and enjoy.